The Notice of Overdue Account is to be sent out as a first warning to a customer that their account is past due. If not resolved by this letter, send the Second Notice of Overdue Account. freelance designer there are many documents that must be submitted to the client. Organization is key when needing to finish a project fast. With my Contract Pack I also purchased Proposal Pack Wizard. With the Wizard I can easily keep track of all contracts and proposals to every client I have. Right from Proposal Pack Wizard I can attach any contract document to my proposal with a click, Thanks to it I am back on track." This Notice of Overdue Account is included in editable Word format that can be customized in Word or by using the included Wizard software. Re: Invoice 30 Days Past Due. As a professional courtesy to you, this notification is to inform you that your account with us appears to be 30 days past due for the month of Month and in the amount of Amount. Please submit your payment to us as soon as possible in order to clear your past due balance with our company. Failure to do so will result in a "Final Notification of Overdue Account" letter from our company stating that you have 15 days to make payment and bring your account up to balance. If your account with us remains in delinquent status for more than 61 days from the initial due date of the invoice, signed work order, or other billing document related to this balance, your account will be immediately suspended and may affect the services or delivery of the product or products ordered from our company. If you have already taken care of the delinquent balance, you may disregard this notice and accept our thanks for your timely response to this matter. If you have any questions, please contact us at Phone Number. Thank you in advance for your immediate attention to this matter. 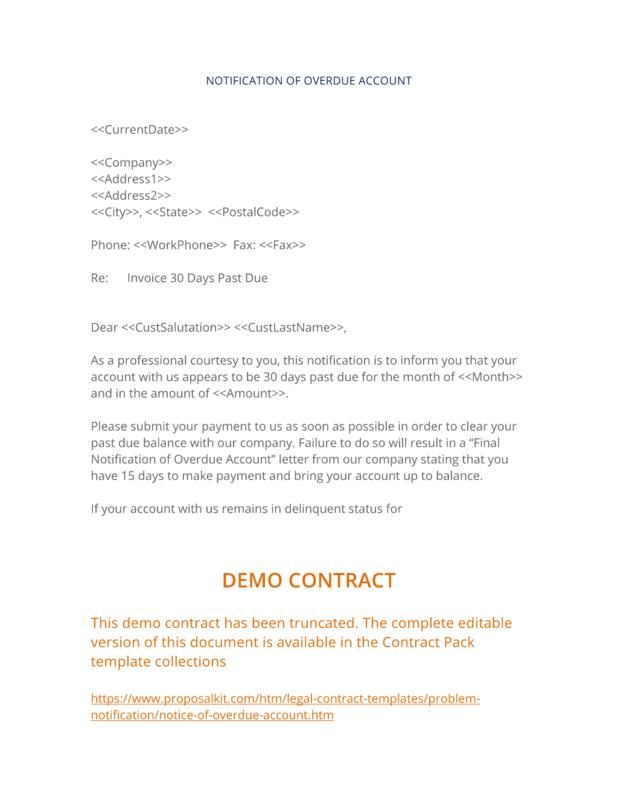 The complete Notice of Overdue Account - with the actual formatting and layout - is available in this Contract Pack.